The first of the Milwaukee County Zoo’s three lion cubs, Hubert, will be leaving the Zoo the first week of November. Hubert is heading for the Oklahoma City Zoo where he’ll be paired with a female, hopefully for future breeding. The Zoo’s remaining cubs, female Njeri, and male Kiume, also will leave in the near future. The cubs were born in July 2011 to mother Sanura, and father Themba. Hubert was named after Harris Bank’s feline community ambassador, as part of a BMO Harris Bank-sponsored cub-naming contest last fall. 6 p.m. to 9 p.m. and Saturday from 9 a.m. to 9 p.m., as the Zoo celebrates Halloween during “Halloween Spooktacular,” sponsored by Sendik’s Food Markets. 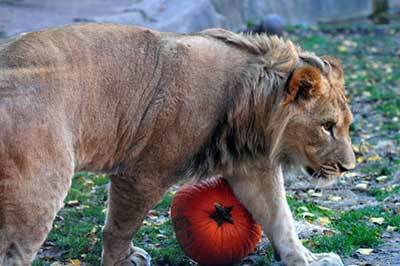 As part of the special event, the lions will receive real pumpkins on Saturday at 3 p.m. Both the Milwaukee County Zoo and the Oklahoma City Zoo are accredited by the American Zoo and Aquarium Association, and adhere to strict guidelines for breeding within their collections, in order to further genetic variations of animal species.